It should come as no surprise that New York City was a rather rebellious place when it came to respecting the laws of the Eighteenth Amendment. We will explore this Greenwich Village neighborhood that certainly was also at the vanguard of so many radical changes in American society in the Roaring Twenties. We’ll learn about some of the stars who frequented the speakeasies. The actors, writers, poets and the playwrights of the era and other bohemians. And we’ll also learn about some of the club owners and entertainers who earned in some cases millions of dollars and how they kept the alcohol flowing and the parties rolling right under the authorities noses. We’ll visit some unusual not so unusual haunts on this tour including a place more associated with literary greatness where the Village Voice newspaper was founded and perhaps the most famous speakeasy of them all that once had two entrances—one for patrons and one for the police. Start time is 2 PM on Wednesdays and Fridays. We will visit three or four pubs in three hours time. The tour will be in the Greenwich Village neighborhood. We will walk approximately 1.4 miles on the tour between the pubs. The tour will include one complimentary beverage not to exceed $10. Tour goers will be responsible in paying for subsequent drinks. Between the pubs, you will see the sights and you will learn some of the history related to those sights. Tour content will include some true crime history on the streets and the history of Prohibition will largely be dispensed inside the pubs. Included in this narration will be the rules and regulations of Prohibition. What was legal and what was illegal. 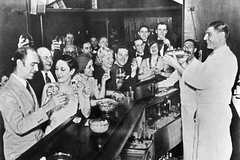 The changes the liquor industry underwent during Prohibition. We'll examine a few of the officials and entertainers who had ties to the neighborhood. We will spend approximately 35 to 40 minutes inside each pub. You will have the opportunity to drink cocktails from another era and learn about mixology. Further, most pubs we visit will have food menus as well including the original location. Tour will run rain or shine. The pub crawl will end at approximately Bedford and Barrow Streets very close to more restaurants and public transportation. Three of the pubs we visit were actual speakeasies during Prohibition. And the other pubs are hidden or what we like to call speakeasy-inspired pubs. This will give the illusion as if you are entering a forbidden location during Prohibition.